Apparently September was the month of the audiobook! Still, they have kept me company during some particularly lonely times. I really enjoyed this, more than I did "The Hunter's Prayer". The story here was more family-based, with the main character being a very successful financier who deals with shady clients - although that isn't what the main plotline focuses on. The story held a few surprises and was a very satisfying listen. I loved this audiobook. It was beautifully, lyrically read and the story was intriguing; it certainly held my attention. I read some reviews which said that the book was over-long for the story, but it didn't seem that way to me. I savoured every little detail. I read a very powerful book recently which detailed some of the events in Italy during WWII ("Beneath A Scarlet Sky" by Mark Sullivan), so it was interesting to read another novel set in the same time period, as it's something I know very little about. I enjoyed the twists of the plot and I also wallowed in the setting. I want aware of any particular description of the scenery, but I was left with a very clear sense of Sorrento and Naples. The author managed to evoke the atmosphere without my having noticed. Normally I am very alert to passages describing scenery, or characters, as often I quickly find them tedious. Not so with this book. It really was the audio equivalent of curling up in a comfy armchair wrapped in a fluffy blanket, where one can sink into the world of the novel. This is the second in a series of books set in and around Sandhamn, an island in the Stockholm archipelago. I enjoyed the first one and I also enjoyed this one. I wasn't as keen on the narration though. It seemed to be a bit rushed - and this from someone who talks very quickly herself! That combined with the American accent caused me to struggle a little with following the thread at the start. I did get used to it, which is just as well, because I have the third book next in my queue! The third Sandhamn novel in the series and again, thoroughly enjoyable. As in the previous novel, I wasn't all that keen on the narration, but it was ok. I suspect the sound quality wasn't ideal and made a slight sibilance more prominent. The narration was excellent, but then I am always going to be more attuned to a British accent, so I'm biased. I did enjoy this book. I have often drifted away from Robert Harris books, as they haven't grabbed my attention. Similarly, this one started slowly, and I wondered how a whole novel could be built around the vote for a new Pope. Well, it can, and the story was fascinating. A few surprises and twists along the way, and quite an ending! The fact this was an audiobook may have helped me get into the story, as there was no harm in letting it run, whereas a printed book may well have been discarded as a perceived waste of time. Obviously I rarely simply listen to an audiobook, I am usually doing something else at the same time. This was a long book to get through, although a very interesting one. On the whole the narration was good, although some of the sentences were rather long and peppered with subordinate clauses, which interrupted the flow a little. The narrator occasionally hesitated with his delivery. I guess that's the occasional pitfall with an audio version of a book like this. The book starts with a history of the middle east and then moves through history to more recent times. It does have "a new history of the world" in its title and it is that; dealing with the last few centuries very much from the non-western viewpoint. It discusses the decisions made by various western countries and the impact these have had on the middle east, leading to the situation we are now in, which is not good. I did get a little bored around the second world war, but then became more interested as we moved into the later years of the twentieth century. It certainly put this into context for me. The writing was a little dense in places, but never too convoluted that it didn't make sense. For a history book it was an interesting read, not at all dry. I decided I would try an Ann Cleeves novel, as I enjoyed the"Shetland" tv series. I wasn't disappointed, this is a competent police drama, probably made more enjoyable because I was already familiar with the main characters. The latest book in the "Shetland" series. Enjoyable, decent storyline, familiar characters again. These books are not outstanding, but great background listening. A fairly respectable number of books in August, no doubt assisted by my new-found liking for audiobooks. Slighly hampered by a bereavement, but whereas I haven't wanted to read, I have been quite happy to listen. For once not a Joe Pickett novel, but just as enjoyable. Not many of CJ Box's books have disappointed me and this certainly didn't. The descriptions of the countryside are very evocative, something that I always appreciate and find very calming, even in the midst of a thrilling plot. I hadn't read the earlier books in this series, but it didn't matter: I want aware there had been when reading. I picked this for my August Audible allowance. Yes, I'm a big fan of the TV series, so I was likely to enjoy this, which I did. I would agree with some of the reviews which said that the acting from the main characters was a bit wooden at times: that of David Duchovny particularly. Maybe his style just doesn't translate that well to audio-only. It was great to get back into the X-files world and all the main characters were there, including my favourite, Walter Skinner. Mitch Pileggi has a wonderful voice, I could listen to him for hours! Good, as always. The most recent Bryant and May. Rambling at times, but then so is Mr Bryant. These are stories to savour rather than rush. They unfold gently and I find the audiobooks quite transport me into the world of the Peculiar Crimes Unit. I like Kevin Wignall's books and I very much enjoyed this one - I listened to it in one sitting! I felt the ending was a little unsatisfactory, most likely because it wasn't what I expected. For the most part, it was tense, surprising and an interesting study of two people on different paths in life. Enjoyable, but within a few pages a man and a woman have been introduced to the reader and I'm thinking "are they going to end up getting together ". I don't want to spoil the ending, so suffice to say I enjoyed the story. It was, perhaps, a little predictable, slightly grown-up Mills & Boon, but I was interested in the characters and the setting was beautifully described. That and the book was sold in aid of charity. A day in bed thanks to illness got me through the whole of this book. I enjoyed it, as I do most of Kevin Wignall's books. A well-paced story, switching between the past and the present, drawing the threads together well. Narration was good, too. Simon Vance has a very pleasant voice and he made the various characters stand out just enough. One of my favourite novels, so I was happy to see it on offer with Audible. I passed some relaxing hours enjoying the tales of Mr Satterthwaite's encounters with Mr Harley Quinn. For me, the stories never get old. Can't go too far wrong with Hugh Fraser as a reader, either. Sometimes it's hard, this living thing. This week is particularly hard. It was excruciatingly so three years ago yesterday, when we were told that my lovely Mum had died. It will be heartbreakingly so tomorrow, at my Dad's funeral. Then, again, ten days later, on his birthday. Today is the in-the-middle day. Final arrangements made, my best friend has arrived, my brother and his family are nearby and, yet, if I could not have tomorrow, I would. I also know that it won't be as bad as I think it will be; I found that at Mum's funeral. I also know that it will "help", certainly in the future, if not immediately. Actually I have realised it's after midnight now, so it's no longer the in-the-middle day, which it was when I started writing. Although, my Dad was always happy to point out that in summertime, "afternoon" really started at 1pm, not 12pm. So, using that logic, is it currently still Tuesday, until 1am? I don't know. The timestamp on this site's admin panel says 23:30, so maybe I'll go with that and you can ignore this paragraph. Undoubtedly I am slightly protected from the most raw of emotions by the medication I am still taking as a result of the effect on me of my mother's passing. The experience has been different this time, as I cared for Dad at his home (with masses of help from the district nursing team, a local care firm and the truly wonderful Marie Curie nurses). I was there, holding his hand and talking to him as he slipped away and I'm glad I was. I wish it hadn't had to happen, naturally, but I did the best I could and now I have to find the courage to move on. Slowly. Day by day. I feel I have to reappraise my place in the world, as I now feel alone in it. My brother has his own family, which, I'm sure, is a great comfort and also a distraction. I don't have that and there have been a number of days recently when getting out of bed has seemed very overrated. That should pass, in time, but I know, too, that things will never be the same again. Which may, in some way, turn out to be a good thing, or at least not such a bad thing. A voyage somewhat into the unknown, but one that we all have to embark upon at some point in our lives. July has been a better month, partly because I have started listening to some audiobooks, which is something I can do whilst working - to a point. This book isn't so long, or tedious, that it took me six weeks to get through it; rather I haven't been in the mood for reading, for personal reasons. This book is the first in a series called "The Eden House Mysteries" and I have more of them queued up. The author is a friend of a friend and on the strength of this book, the recommendation was quite appropriate. I found this book most enjoyable and a decent thriller. I listened to this, rather than read it. The narration was fine and overall the book was ok. I found it a little clichéd, with rather stereotypical characters, so I'm not sure I will read any more in the series. Parts of the story seemed rather far-fetched, and, in that respect it wasn't the way I expected a story set on Lindisfarne to develop, so for that very reason it jarred a little with me. This was June's Kindle first, so I'm playing catch-up. The story starts with quite a jolt. The main character's confusion and then shock/horror were conveyed rather well. Then the novel gives the reader a good glimpse into the world of the main character: always on the move, to avoid the repercussions of what her ex-husband did. The author conveys that claustrophobic existence well and then things ramp up. The reader is carried along on the journey. Yes, maybe there are some flaws in the book, but really it's a very good thriller which I enjoyed. I have pre-ordered the sequel. Another audiobook and another in the Bryant and May series. Always good books, but I didn't feel this was one of the best. Others I would read again, but not this one. I enjoyed it though, and the narration was good. This is a very different style of book from the Bryant and May series - yes L K Fox is a pseudonym used by Christopher Fowler for this book. It's good, although I'm not sure I liked the ending. That said, I'm not sure I was supposed to. The story is told by two different people. Well, really they are relating their own stories, which, as might be expected, cross over later in the novel. Actually, they cross over sooner, but that isn't apparent until much later on. It's an intriguing tale and I didn't catch on to a few things until perhaps later then I was meant to. It was a mystery carefully unwrapped by the author. A good read and I look forward to more in this style by one of my favourite authors. I generally enjoy Dana Stabenow's books set in Alaska and this was no exception. It is the third (of four) in the Liam Cunningham series. Another decent thriller which develops the main characters a little more. Stabenow's style is simple and engaging. These are as good to listen to as they are to read; the narrator differentiates between characters well and really brings the story to life. What else, other than books read, of which there were none in June. I'm on a go-slow at the moment, as life is a bit hectic. I have also signed up to Audible, so there may even be books listened to in future. My other dilemma was the gold nib. Which hand? I don't mind switching writing hand with a steel nib, but I tend to stick to one hand only for a gold nib. The right won this pen; it seems to be slightly smoother when written with the right hand. 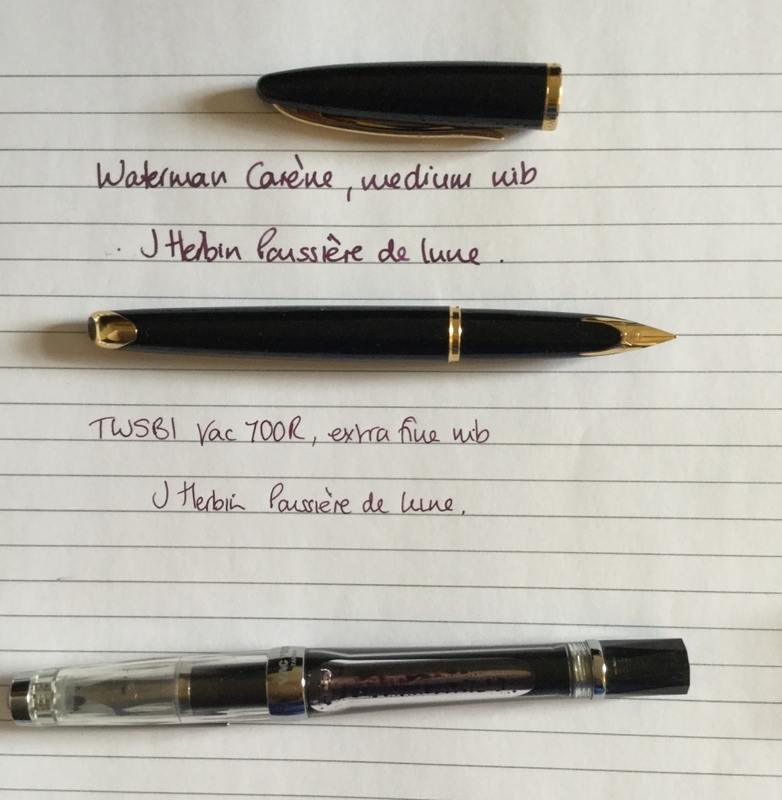 It joins my Parker 45 there, whereas the left hand gets to use both my Pilot Capless pens. Of course, the day after finding this bargain, I came across the TWSBI Vac 700R for £16 less than I had seen it for in other places. I have a Vac Mini, which I like, but quite fancied the full-size one, even if only for the ink capacity. However, I didn't fancy it £75-worth, so held off. This, too, has Poussière de Lune in it - I had it to hand. Again I'm not sure it will stay inked with this, although it probably will. (It will for a while, thanks to a large capacity and extra-fine nib). I have to say, along with, I suspect, a lot of other people, I find the matte clip somewhat incongruous and irritating. That said, when I'm using the pen it doesn't matter, as the cap is on the desk. Otherwise, the pen is most useable. The nib is pretty smooth, unlike some I have tried. I hope this will be a decent workhorse. No doubt time will tell. Another fairly poor effort by me in May. I'm struggling with insomnia and am to have lost my reading mojo again; apparently I'd rather lie around and fret than lose myself in a good book. As ever, a good read, about familiar characters. This latest Joe Pickett novel picked up on a thread from earlier novels, but if you haven't read the earlier books, that doesn't matter. I always enjoy CJ Box's books, particularly ones set in the wide open spaces and mountains of the US. I find the depiction of that environment soothing. I enjoyed the majority of this book. It was an entertaining tale of families in a nice area of Australia. It was clear that the narrative was leading up to an event, as there were interjections from characters from after the event. Equally it was clear that a death was involved. I didn't guess who and I didn't guess why. Unfortunately, once the book reached that point, it then seemed to end quickly, in contrast to the slower build-up. It left me feeling like "oh, it's over then". All resolved a bit too quickly and neatly. Last week I finally got round to making a donation to a podcast that I enjoy and listen to regularly, "No Agenda". Yes, it's controversial and yes, I don't always agree with what is discussed on the show and it is rather US-centric, but it does make me think about the spin that is put on any news disseminated nowadays. The podcast has no sponsors; it is funded by listeners, so is able to maintain a level of independence. I decided this was worth some of my money, so I donated. I was very fortunate to be the only person donating at a certain level, so got an executive producer credit. At some point I will donate again, as long as I keep listening to the show. Many people have written on the subject of getting things for free, particularly on the Internet, so, unfortunately, here is more of the same. Nothing new, just my thoughts on the matter - and how my view has changed in recent years. Like a lot of people, I used to think it was absolutely fine to have information and/or entertainment available for free on the internet. I grew up before the internet was even a thing, so I have seen it grow from an entertaining diversion, to the all-pervasive behemoth it is today. I think there was a time, somewhere along the way, where information was available as a public service, intended to help and inform. That is, largely, no longer the case. I have also matured and become disillusioned with a lot of things in the world. One of these is the lack of truthfulness (I don't go so far as to say it's a lack of basic honesty). Questions asked of politicians are evaded, with no straight answers given. People are generally lied to by their elected representatives, yet nobody seems to hold them to account. Gradually I have become more aware of the amount of manipulation that we are being subjected to all the time; in politics and in our daily lives. I sometimes wonder if any truth is written/spoken by the media nowadays. Certainly the news programmes in the UK do far more than present the facts. There is always someone who explains the story, or pontificates on the impact, or what might happen as a result. Me, I generally just want the facts on the news; if I want to hear dissection and discussion, I will tune in to one of the magazine programmes. I digress, though, as the main reason for starting this post was to put down in writing some of my feelings about being manipulated and "owned" by big corporations. As I get involved in more social media I become aware of the amount of data that is collected and used. For example, I understood that Facebook would collect data about what I liked, who I followed what I posted. It took a while for me to realise that it tracked what I did outside the app. Adverts appear on Facebook related to things I have browsed for in Safari. That unnerved me more than a little and I don't like it at all, but I still have my Facebook account, because it's a convenient way to keep in touch with people. However, I don't post a great deal. I joined Twitter before Facebook and enjoyed it, which I still do. I use a third party app, which makes the experience a little better, but it is still a shouty place, which exists to serve up ads (that I don't see). As a result of all this, I mostly interact on 10centuries.org, which is a platform run by one man (and his dog). He hosts my blogs, runs a social media element and is developing more facets to the service. I pay for this (not a lot) and because I pay, I am the client. People have said: "if you aren't paying for the product, you are the product" and this is so very true. Over the last few years I have all but abandoned my Wordpress blog, along with some other free services. I'll admit to using Instagram, though, as I enjoy it. I have moved to paid services for rss feeds (Newsblur) and for saving links (Pinboard). I have also been looking into the Indieweb more and more recently, although I don't really understand it. The way I see it, the only way I can really own my data is by self-hosting, which is something I don't have the time or skills to do. For now, I will be content with paying for hosting, both on 10C and, more recently, micro.blog. This is clearly a journey I am on, with the learning that accompanies it. To that end, I am grateful for all the advice and assistance I receive from people far more experienced in the web than I.
I downloaded this book as my March Kindle First choice. I didn't really expect to enjoy this, to be honest this; a novel set between depression-era America and the Soviet Union. Consequently I was very pleasantly surprised, as I thoroughly enjoyed it. In fairness, it wasn't a fun book, as it was quite stark and brutal, but it was an epic-feeling story. I hadn't known that many Americans fled the US in the Depression era, in search of a worker's paradise in the USSR. I also have no idea how accurate the tale is, but, for me, it painted a vivid picture of the hopes of the immigrants, the brutality of the Soviet regime and how these hopes soon faded. In addition it had plenty of plot twists, so all in all, a book I would recommend. This book is based on a true story. It tells the tale of a young Italian, Pino Lella, during the second world war; from escaping the Nazis in Milan, through helping Jews to reach Switzerland by guiding them through the mountains, ending up enlisting at the age of 18, and becoming the driver of a senior officer in the German army, during which time he spied for the Allies. A truly fascinating story and well written. This, too, is a period in history I didn't know much about. Plenty of books are written about Germany, France, the UK and other countries during the war, but I haven't come across much about Italy. What was particularly nice was the author's notes at the end, in which he describes how he came to tell the tale, along with updates on the fates of the main characters during the remainder of their lives. Another book I thoroughly enjoyed and also felt that I learned from. Only two completed books in March. Yet again, life got in the way. Despite having a week off work, I didn't get much reading done; most of my time was taken up ferrying my father to his radiotherapy appointments. I listened to plenty of music, though and maybe some of my sleepless nights would have been better spent reading, but if the mind doesn't want to escape into a novel, it won't go. February's Kindle First. I enjoyed this novel. It is set during WW2 & I have to say it probably wasn't what I expected. Firstly, I assumed the author was male, which turns out not to be the case. Secondly, probably as a result of the first, I assumed that the story would be more of a mystery novel. It contains a mystery, sure, but it reads more like a romance novel. That's not necessarily a bad thing, just a bit of a surprise. Once I got used to the story, I found it easy to read. It was just about plausible, if somewhat almost quaint at times. I doubt I'd seek out other books by this author - a bit light for my taste. I didn't know what to expect with this book, as the title implies. I felt as confused as the main character for some time . I thought "ah-ha", the writer breaking the fourth wall, as it were, and interjecting his commentary on events. Or was it? The novel centres around a man named Bentley, who ends up in Yorkshire, with no memory. The story is set in the Whitby area; a place no stranger to being a setting for gothic tales. That could be a clue in itself, although less so for me, as the author is a friend - my former primary school teacher, who was a very positive influence on me when I was young. To that end, the story is set fairly local to where I grew up, so I didn't make the association with the gothic as readily as someone else might. And no, the main character isn't a vampire. Bentley receives kindness from the locals, falls in love and tries to find out who he is and about his past. Gradually his story unfolds and becomes quite shocking and slightly far-fetched, but intriguing enough to continue. Towards the end things take a very different turn and once again I was surprised, in a good way. Certainly an entertaining read and it kept me guessing. Only one book completed this month, which would be pretty dire, except that this is quite a long read. It also took me a while to settle in to the story. Not being Chinese, the whole setting was, well, "different". I did spend a while wondering how the story was going to develop into a science fiction novel, but it did and it is well worth persevering. This is the first in a trilogy and I look forward to reading the other two books, although I shall take a break between them, I think. I have long been a fan of epic space novel series, so this should be right up my street. Having said that, it is at times pretty bleak and I believe the last book might be even more so. At the time of writing, I am still on February's Kindle First book, with March's unopened. In addition, a friend introduced me to the works of another author, so I have a queue of his books, plus I discovered my friend had written some books, so one of those is now in the queue (the others are for children). I really need to escape into the world of the written word more. Life is a bit tense at the moment and when I feel like this I tend to stop reading, which is probably the opposite of what I should do.